For over 30 years the Perfector Skincare Micro-Current products have proven to be both popular and reliable around the world. Now, through this expert knowledge and our commitment to continuous improvement, we are pleased to offer the new Cell Communication System “CCS7”. Perfector Skincare products have always been highly affordable without compromising on quality. A combination of first class training and customer support continues to provide all users with a cost effective route to offering expert professional treatments. Our scientific research has shown that this artificial language must be delivered via a very low current but within a highly defined signal in a system which minimises external “noise” interference in an effective manner. Precise signal waveforms combined with constant currents communicate with our own body’s electrical impulses, thus mimicking our natural resources to increase the health and vitality of our skin. Perfector works on the cell membrane which is regenerated through the positive and negative electrical signals produced by the CCS7. When the charge is altered the protein is encouraged to change shape and thus accept nourishment whilst rejecting any harmful elements. A specific channel type “Adenosine Tri-Phosphate” (ATP) turns the cells in to a constantly recharging biological battery often likened to AGE REVERSAL. The new Perfector Skincare CCS7 maximises the advantages of our advanced non surgical face lifting knowledge and techniques. The long term benefits of having a Perfector Skincare treatment are best achieved through a short course of refreshing treatments that are sustained by regular follow up appointments. For clients with little free time but still wanting amazing results! A course of 10 treatments over 3 to 4 weeks is recommended with monthly maintenance. A one off luxury treatment which delivers the Perfector Skincare technologies in combination with our specially formulated Algae Masks and our tailor made lymphatic facial massage utilising bespoke massage lotions in conjunction with Booster Serums. A Detox facial designed for clients who have congested skin, tired skin or a tired complexion. Ideal as an initial boost to brighten the skin and also perfect for clients wishing to embark on a face lifting course. A Detox facial incorporating lymphatic drainage movements, a Rehydrating Mask with Algae Extracts and facial massages. Most effective as an initial course of three treatments tailored to suit each individual client (to be advised by a trained Perfector Skincare specialist). High frequency sine waveform encourages blood flow to the surface of the epidermis creating erythema. Extra low square waveform builds deep levels of the skins structure. Plumping facial muscles and lifting facial features. Mixed levels of nano current together with specially formulated probe movements encourage lifted more defined facial features. Best suited for the top half of the face. To include eyebrows and cheeks. 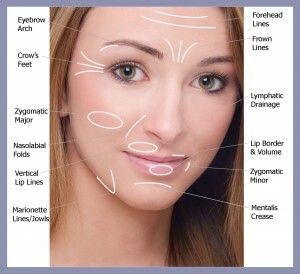 Unique frequency patterns help to eliminate puffiness and define facial features. Best suited for the lower half of the face e.g. the jaw line. Mixed sine waveform encouraging lymphatic drainage, combating dark circles and under eye puffiness, whilst lifting the brow. Combination of ultra low frequencies and our unique flat probe technique transform facial features, culminating in a more defined and brighter complexion. 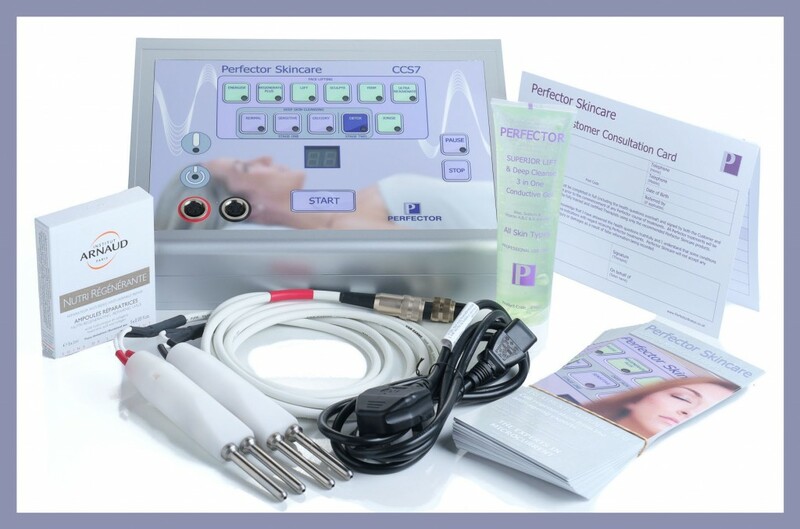 Introduce a Collagen and Elastin product deep into your clients skin, with the assistance of this ionisation programme. As we age our own important Collagen and Elastin supply naturally depletes. A comprehensive range of highly effective detoxifying facial programs perfect for cleansing breakouts, congestion and acne. This second stage treatment of the deep cleanse programme detoxifies the skin whilst eliminating waste, reducing puffiness under the eyes and around the jaw line whilst encouraging drainage. We operate a policy of continuous product improvement – specifications are subject to alteration without prior notice. * A contribution towards expenses may be required depending upon location.